The number of households in Slovenia is growing faster than the population. Between 1961 and 2002 the number of households increased by nearly 50%, while the population increased by a mere 25%. Between 2003 and 2007, the number of households increased by 4.5% and the population growth was 1.5%. In 2007, there were 745,000 households in Slovenia. The share of smaller households with one or two members is growing, while the share of households with more than three members is decreasing. Smaller households have higher expenditures and a greater impact on the environment. The indicator shows the development in the number of households and population by the number of members. A household is a community of people who live together and spend resources for basic needs (apartment, food and other vital consumer goods, etc. ), or a person who lives alone (definition by the Statistical Office of the Republic of Slovenia). 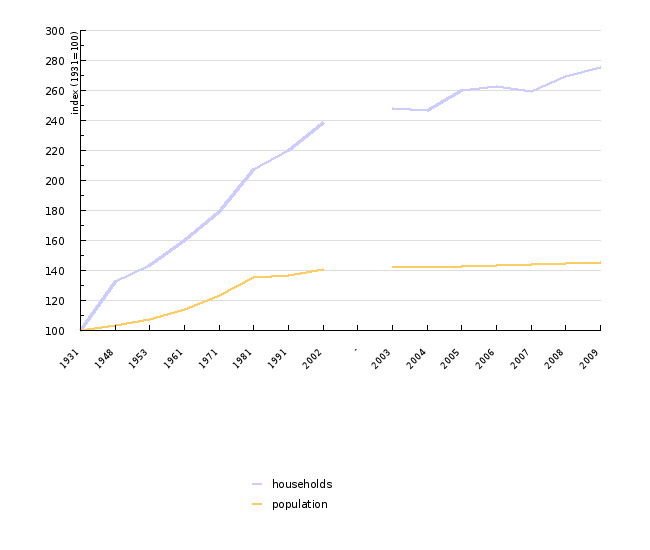 Population Census 1931-2002, Statistical Office of the Republic of Slovenia; since 2003: EUROSTAT 2009. Statistical Office of the Republic of Slovenia, Censuses of the Population, Households and Dwellings 1991 and 2002. Statistical Office of the Republic of Slovenia, SI-STAT Data Portal, 2009. EUROSTAT, Number of persons in households, 2010. Consumption patterns are affected by multiple interdependent economic, social, cultural, and political conditions, such as growing revenue, globalisation of the world economy and the opening of new markets, new technologies, increased individualism, ageing of the population, etc. The activities related to construction and management of dwellings, including road construction, heating, cooling, electricity, water consumption and generation of waste have a negative impact on the environment. In Slovenia, the number of smaller, mainly one-member households has been growing. Between 1961 and 2002, the population grew by a mere 25%, while the number of households increased by nearly 50%. In comparison to 1991, the share of households with more than three members fell in 2002 on account of smaller households with one or two members. Between 2003 and 2007, the number of households grew by around 4%, but the methodology of data collection has not been the same before or after 2003. In 2007, Slovenia had 745,000 households. Smaller households have greater impacts on the environment due to their higher expenditure and increased travelling distances. The population in Slovenia is ageing, which also influences the changes in the consumption patterns. Health- and travel-related expenditures have risen. The number of dwellings has also risen, by 63% between 1971 and 2002 (in the same period, the number of households increased by 33% and the population increased by 14%). The European area has also noted growth in the number of households, which provides environmental restraints, such as air and water pollution, excessive land use, and generation of waste. Thereby, the conference in 2007 in Ljubljana (Time for action – towards sustainable consumption and production in Europe), on the basis of the EIPRO Study, recognised households as one of three fields to be monitored (besides transport- personal transport, travels, trips, vacations, etc., and consumption and production of food and drinks). Allegedly, in light of the life cycle of products, these fields have the greatest impacts on the environment. The product life-cycle method establishes negative impacts due to substance and energy use in production, in the period of their duration, and for their final removal (often referred to as the 'from the cradle to the grave approach'). In 1995, the average European household size was 2.5 persons, and according to the assessment by the European Environment Agency this number will keep falling in the following years, which will increase the demand for more dwellings. Urban expansion outward and lower population density in cities require construction and renovation of buildings and infrastructure, and thus also land modification, greater energy consumption and generation of construction waste. Source database or source: Statistical Yearbook 2006 (Population Census 1931-2002, Censuses of the Population, Households and Dwellings 1991 and 2002); EUROSTAT (Contextual indicators, Number of households); SI-STAT Data Portal (Population by age groups – annually). Data administrator: Statistical Office of the Republic of Slovenia (SORS), EUROSTAT. Methodology and frequency of data collection for the indicator: SORS, annual data collection on the basis of the population census; EUROSTAT, a more detailed methodology of data collection has not been published. Population censuses are used by the Statistical Office of the Republic of Slovenia to compile data on the size and basic structure of the population and households. Nine censuses have been carried out on the territory of Slovenia since the First World War: 31 January 1921, 31 March 1931, 15 March 1948, 31 March 1953, 31 March 1961, 31 March 1971, 31 March 1981, 31 March 1991, and 31 March 2002. During the censuses in 1971, 1981 and 1991 a housing census was also carried out, in 1991 a census of agricultural holdings, and in 2002, for the first time, a census of buildings. The data for 1991 is calculated according to the 2002 Census methodology. 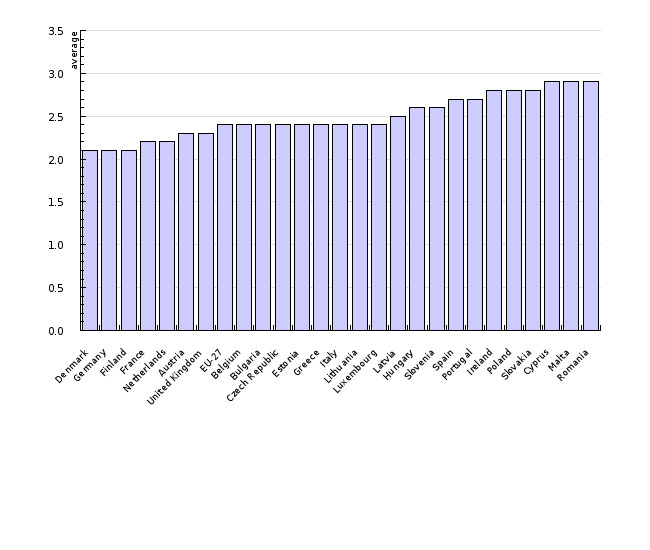 Since 2003, the data provided in Table 1 has been derived from the Eurostat database: Number of Households (the indicator is defined as the number of private households. Private households are either a one-person household or a multi-person household, i.e. a group of two or more persons who combine to occupy the whole or part of a housing unit and to provide themselves with food and possibly other essentials for living). The data provided in Table 3 is derived from the Statistical Office of the Republic of Slovenia (SI-STAT Data Portal), which collects the data on the age structure of the population annually. Data in Table 1: The development in the number of households and population is calculated according to the index with the base year of 1931. 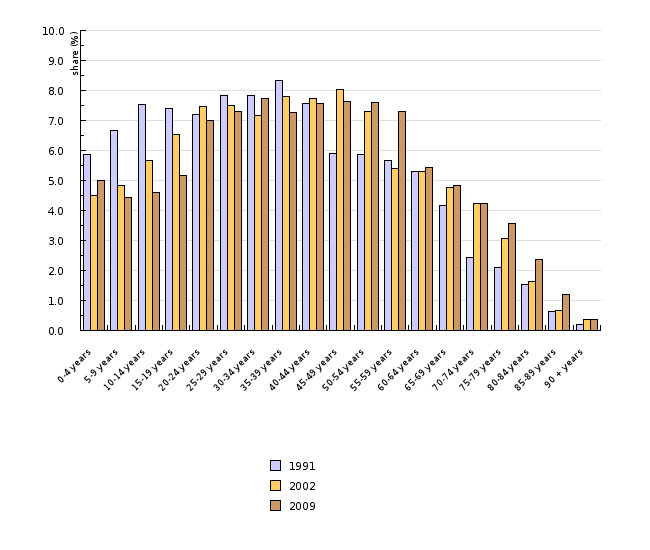 After 2003, the data has been derived from Eurostat, therefore it is presented in a separate plot. Disadvantages: The common methodology for data collection was only followed until 2002, and since 2003 the data on the development in the number of households has been derived from Eurostat, which is not entirely comparable. 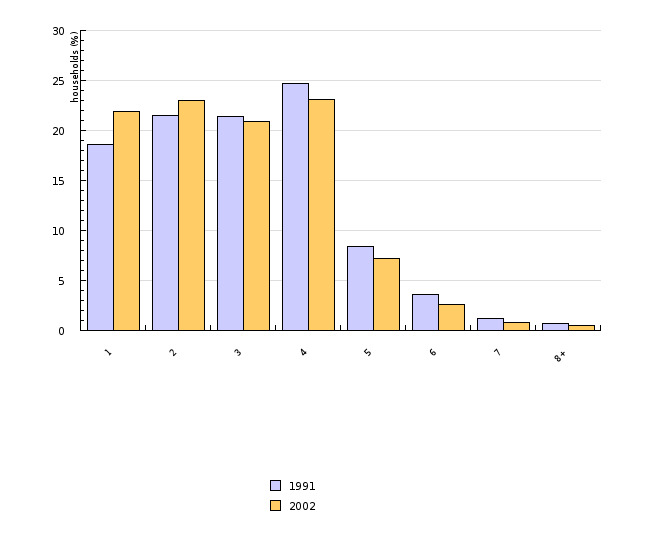 Data considering the households by the number of members and the population by age groups is only available until 2002. Reliability of the indicator (archival data): The data is reliable.